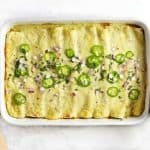 This Vegetarian Black Bean Enchiladas recipe is healthy yet incredibly flavorful and satisfying. Best of all it is easy and the leftovers are awesome! In a large measuring cup (or small/medium bowl) combine the green enchilada sauce and Greek yogurt. Set aside. Peel and dice the onion. Drain and rinse the black beans. Dice the bell peppers. Cook Onion: Put the olive oil and diced red onion in a large pan over medium to medium/high heat. Cook until they’ve softened (about 5 minutes). To the pan, add the black beans, spices/seasonings (chili powder, cinnamon, paprika, cumin, salt and pepper) and water. Stir to combine and cook for a 2-3 minutes. Using a potato masher, mash the black beans. For a smoother filling, mash them more. For a chunkier filling mash them less. Once done mashing, remove the pan from the heat. Add the diced green chilis, bell pepper and 1/2 cup of the pepper jack cheese. Stir to combine. Preheat the oven to 350 degrees. Spray a 9×13 baking dish with nonstick cooking spray. Cover the bottom of the baking dish with some of the sauce made in step 1 (about 1 cup). Fill the tortillas evenly with the filling, roll them up and put them in the pan. Pour the rest of the sauce over the top of the enchiladas and sprinkle with the remaining 1/2 cup of pepper jack cheese. Put the enchiladas in the preheated oven for 25 minutes. Let cool for 10 minutes before serving. Top with red onion, bell pepper, jalapeno slices, cilantro, avocado and a squeeze of lime juice.